Did you know? Pilgrim’s Progress is the best selling book of all time other than the Bible! And we have been enjoying the Pilgrim’s Progress All-in-One Curriculum set from Answers in Genesis. ~Don’t miss the giveaway at the end!! We received these Answers in Genesis Pilgrim’s Progress resources in exchange for an honest review. All opinions are our own and we love the benefits and blessings we are continuing to see from this multi-age study. Please see our disclosure policy. What is The Pilgrim’s Progress All-in-One Curriculum Pack? 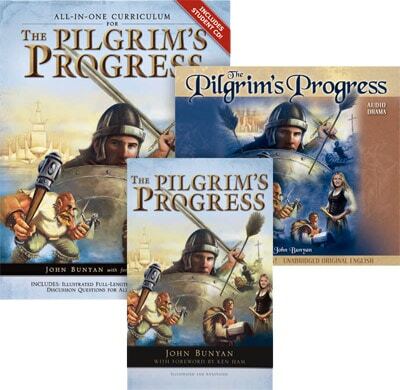 This Pilgrim’s Progress curriculum pack, based on John Bunyan’s classic allegory, will challenge you and your children and help build a love for the truth and authority of the Bible. The curriculum pack is designed for homeschool, family devotions, Sunday schools and personal and small group studies. In the introduction, Ken Ham he shares about the parents greatest job: training children up – developing a taste for the Bible and greater works. He says that of course the most important taste is for the Word of the Lord and the gospel. Pilgrim’s Progress is the greatest Christian allegory (Written by John Bunyan, a preacher, when he was in jail in England.) “…still in print and a best-seller over 300 years after it was originally published. 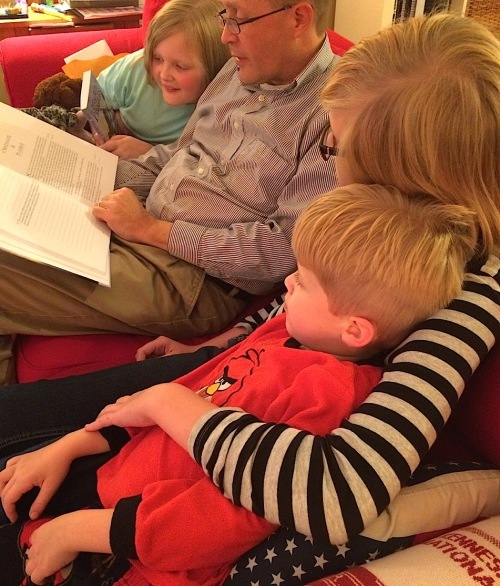 Family devotion time with Pilgrim’s Progress. What is Included in the Complete Pilgrim’s Progress Pack? – The Pilgrim’s Progress, Illustrated & Annotated – Illustrated with the same illustrations in the curriculum. What Ages is the Complete Pilgrim’s Progress Pack Designed For? Suggested for grade 2 to adult, I love when I find something we can ALL listen to/enjoy/learn from. It’s pure pleasure to learn as a family. Less work for mom. Better discussion time. So many benefits! It could be used as a full, multi-age unit study! Visual learner: Eldest Daughter (17-year-old) The illustrations! 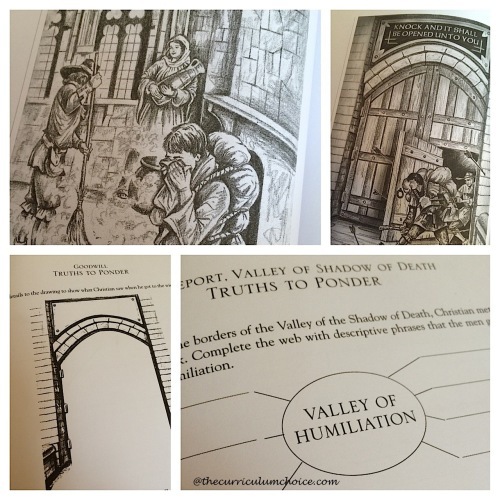 Plus the Truths to Ponder offer activities to complete illustrations. Auditory learner: Eldest Son (15-year-old) thrives on hearing anything read aloud. Precisely why he enjoys Teaching Textbooks math – the lecture. So, when anything it put in the CD player, he is close by. Kinesthetic learner: Middle Girl (12-year-old seventh grader) Those timeline activities, mapping and the sketching (like our visual learner enjoys). I am learning so much myself! Highly recommended! 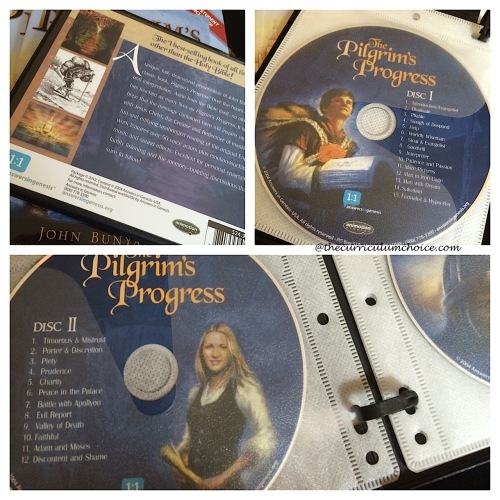 Where Can You Find The Pilgrim’s Progress Curriculum Pack? Pilgrim’s Progress Curriculum Pack is available from Answers in Genesis. You can click over to view free samples and read detailed descriptions. Would LOVE to try this curriculum, alongside our copy of Dangerous Journey! We are planning to read and study Pilgrims Progress this next year. This would be a wonderful resource. We try to read Pilgrim’s Progress together as a family every year. This package would be so much fun! The addition of the audiobook and questions would really help deepen our study and bring all the wonderful lessons to life. I’ve tried reading it with my children once, but got bogged down on it. This program looks like it would be more interesting for them. Would love to use this in our Bible time in school! We would love this to use in our homeschool. What a wonderful way to navigate through this wonderful book with all of my children at one time! I’ve been waiting for a better time, and I’d love to begin now with what seems to be a great tool! I’ve never read Pilgrim’s Progress, but I’m intrigued. Would love to win it! How wonderful! Would love to have this for my son! We would use this program during our family time either in the morning before school or in the evening before bed. We haven’t done anything like this yet, it looks exciting! 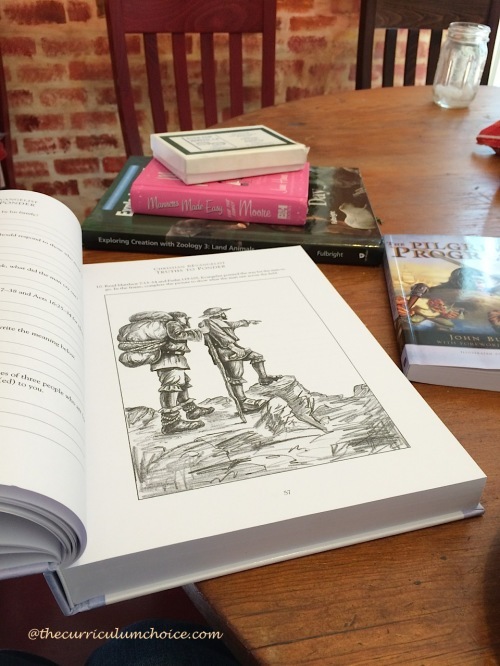 We have not yet studied Pilgrim’s Progress, but this school year, we are studying the Middle Ages, Renaissance and Reformation, so adding Pilgrim’s Progress to our literature and Bible Study time would be a perfect complement to our history studies. I would love to incorporate this into our homeschool. Looks wonderful! I love the fact that this covers multiple ages. We always have a devotional time as a family with our 6 kids and I would love to study this together. We have not read Pilgrims Progress. I would so enjoy adding this to our homeschool program. We could use this for our morning family devotions in school. I have home schooled for 8 years and love it. I have two boys that would absolutely love this!! We started PP as a family read aloud but stalled out. I think we’d prefer to listen to the audio. what an awesome curriculum, I would use it as part of our school for bible/history. What a great program, awesome that it can be used through so many ages, good for large and small families. Thank you for putting this out. I sure hope I win. I have only read Dangerous Journey aloud to my kids, but have been wanting to start the real thing, especially on audio. This would be great to win! Pilgrim’s progress has been on my to-read-aloud list for quite a while. This would bump it to the top for sure! We have been looking for a program to incorporate the bible into our homeschooling schedule. This program sounds absolutely wonderful to do that with. I have been wanting to try pilgrims progress on our homeschool. This would be great. I have heard so many great things about this curriculum! Everything Hodgepodge Mom reviews is awesome! Excited the try it! my husband read and studied this when he was in school and he said it has been one of his all time fave books. I am homeschooling my 3 sons ages 10/13/15 and I think this would be a wonderful curriculum to use with them. As a single, full time working & homeschooling mother it would be a blessing to win this giveaway!!! I am scheduling Pilgrims Progress for Term 3 or for study this summer. I have never read Pilgrim’s Progress, but I’ve heard good things about it. I would love to add it to our homeschool! We haven’t read this yet, but I would love to use these resources! Oh wow! This looks amazing. Love this book! We have not studied this yet. I just brought home a copy from the church library to look over and see what kind of fit it would be for my girls. This set would be an amazing help and tool to use in my house. This looks fantastic! We loved that book and I have not heard that AIG had this available. I would love to go through it again in detail with my 2 boys. I have not tried this. I would like to try this with my children. sounds great. We have the book, but have yet to begin reading it. It would be great to use this as a family. Thanks for sharing this giveaway! This year we read through Part 1 and 2 of Pilgrim’s Progress with our four children (ages 4,6,8,10). Everyone thoroughly enjoyed it and I would like to do it again with greater depth and discussion in the future. thank you for posting about this! I’ve been curious as to how this curric is set up, ages and such. This was so helpful!! I have been wanting to get this for my kids. It looks great. We have read Pilgrim’s Progress, but have not done an in depth study. This would be a great help in achieving that goal! Thank you for the opportunity! We are studying the Pilgrim’s now, but we have not read this story so it would be a wonderful addition to our studies!!! We tried to read together a few years ago, we would love this curriculum to use during Bible time! I would love to use this for my children. We have studied Pligrims Progress with our oldest and this would be great to reinforce that and introduce this wonderful book to our younger girls. This would be an awesome addition to our family. We have not yet used Pilgrim’s Progress, but have a copy ready to read next year. I’d much rather use this package! I would love to try this! We have not used any Answers in Genesis curriculum before, and this looks awesome. I have not used Pilgrim’s Progess in my homeschooling, but I’d love to use it for character training with my twin boys. Looks wonderful! We read a version for younger kids a few years back, but haven’t done anything with it since then. I would definitely use this as a Bible/Character training subject within our curriculum. It sounds really wonderful! We read a younger kids version of this book a few years back, but haven’t done anything with it since then. I would use this as a Bible/Character training subject within our curriculum. It looks really good! Would love to try this in our homeschool. 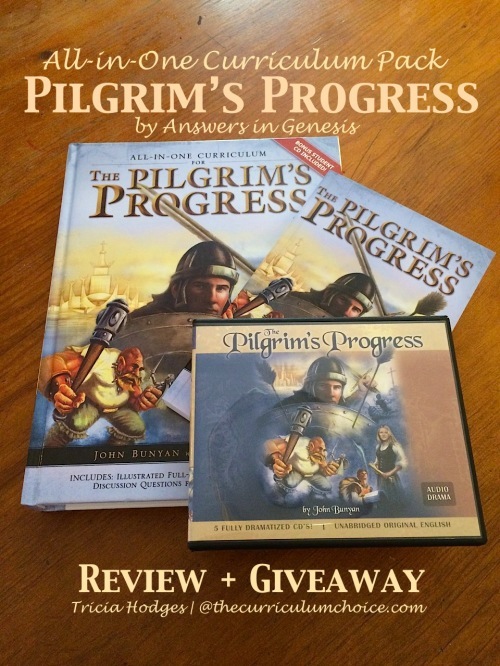 Pilgrim’s Progress is in our curriculum plans for this school year – would love to win this! We have not read this before but hope to get to it this school year! 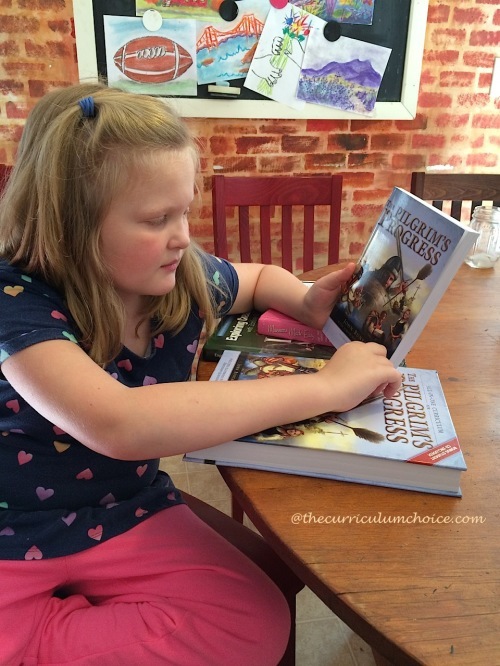 This is my first year homeschooling my four children and I would love to read Pilgrim’s Progress with them. I use Answers in Genesis for their Science curriculum and love their presentation and insight. I haven’t finished it myself yet, but I think it would be great for my husband, myself, and my daughter to go through it together! We’ve read “Little Pilgrim’s Progress” and my boys really loved it! I would love to do the literature study of Pilgrim’s Progress with them! We started reading Little Pilgrim’s Progress out loud, but have never used a study guide or curriculum. The illustrations are beautiful! I loved that book growing up! We love this book! Never knew that had a study guide. We’ve never read The Pilgrim’s Progress. I think that this would be a fantastic way to introduce it to (myself and) the kids! I’d love, love, love this! What a great story! This looks like a great way to teach this to my son and daughters. I have been looking for something that would help me to do so. I would love to get this! Thank you so much for your review as it helped me to understand more about what was included.